Grapes may be more commonly enjoyed fresh, but they are the star of this scrumptious Low FODMAP Grape Crisp! Crisps are a pretty popular dessert here in the midwestern United States. Often filled with freshly picked produce, today’s crisp features a more unexpected fruit, grapes! Grapes are a FODMAP-friendly fruit and can be enjoyed in 1 cup servings during the experimentation (aka elimination) phase. 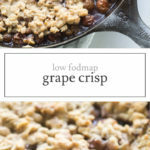 They burst with naturally-sweet, juicy flavor when baked and are perfect in this Low FODMAP Grape Crisp. Preheat the oven to 375°F. 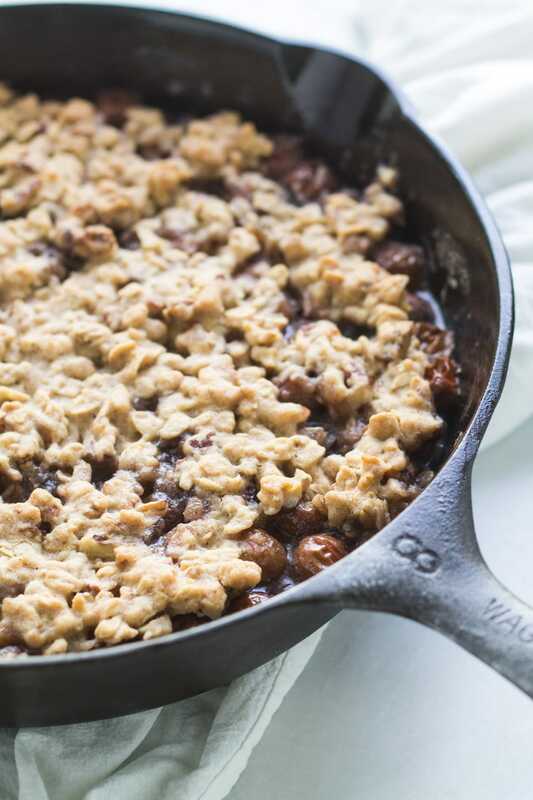 Grease a cast-iron skillet or baking dish with butter. Add grapes and set aside. In a medium bowl, mix together flour, oats, pecans, melted butter, maple syrup, cinnamon, and salt until crumbly dough forms. Spread crumble over grapes. 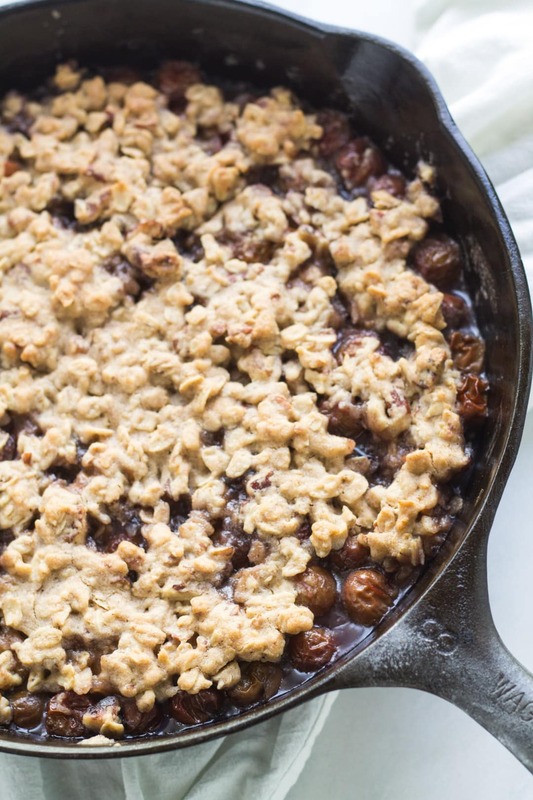 Bake for 25 minutes or until grapes are bubbly and crumble is golden brown. Cool slightly before serving. 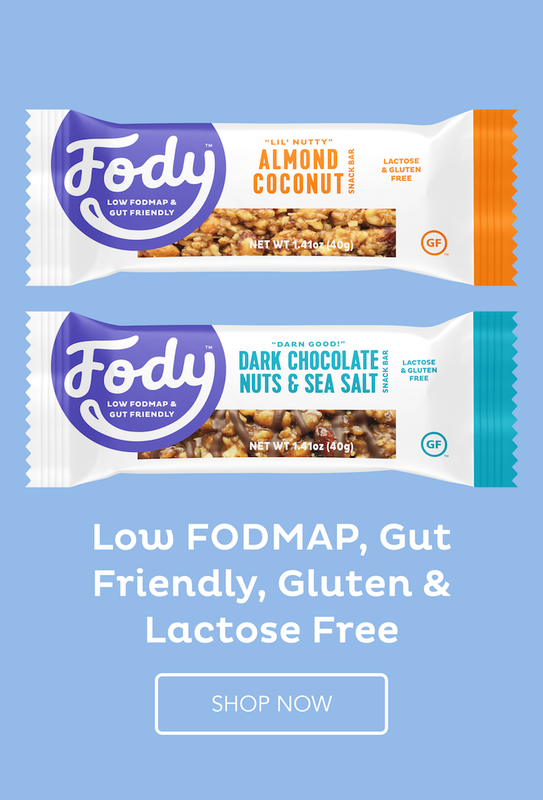 Rolled Oats: A low FODMAP serving is ½ cup or 52 grams. Pecans: A low FODMAP serving is 10 halves or 20 grams. Hi Emily I made this last night and it was so yummy. I grated a tiny piece of dark chocolate once out of the oven. After hiding a small portion I was able to enjoy it cold today. Thanks so much. Dark chocolate sounds like a fantastic addition, Judy! Glad to hear you enjoyed this recipe. Thank you for sharing! !